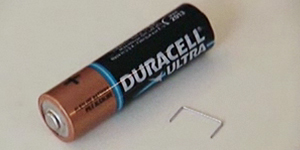 If you are in the woods you may likely have a camera or other device that requires batteries. I imagine that this could be done with AAA, C, or D batteries as well. If you do not have a staple, you are like to be able to come up with a usuable piece "wire-like" metal. The only drawback I can see, and it is a big one, is the necessity of having char cloth or extremely good tinder on hand. Let's go try it out. btw - the guy narrating the video has a peculiar accent (or non-accent) ... I'm guessing somewhere in central Canada ...?